Plenary Lectures. Advances in hydropurification catalysts and catalysis (B. Delmon). Deactivation, regeneration and disposal of hydroprocessing catalysts (D.L. Trimm). Catalytic processing of heavy residues - an overview (H. Qabazard et al.). Progress in the design of hydrotreating catalysts based on fundamental molecular insight (H. Topsøe et al.). New routes to low olefins from heavy crude oil fractions (S. Nowak et al.). Papers. Residue upgrading schemes - a comparative study (A.E.-Hariry). Shuaiba refinery experiences with H-oil unit (M. Embaby). Commercial experience in the operation of atmospheric residue desulphurization units in Kuwait National Petroleum Company at Mina Al-Ahmadi Refinery (T. Saleh et al.). Catalytic hydrotreating of heavy residual oils in HDS units (H. Ozaki, M. Sakamoto). Hydroprocessing of heavy residues: relation between operating temperature, asphaltene conversion and coke formation (M. Absi-Halabi et al.). Rejuvenation of spent residue hydroprocessing catalyst by leaching of Foulant metals (M. Marafi et al.). Studies on deactivation of hydrotreating catalysts: role of molybdena and additives (MgO and CaO) on sintering and phase transformations of MoO3/&ggr;-Al2O3 systems (A. Stanislaus et al.). Activation of cobalt-molybdenum hydrodesulphurization catalysts: influence of the sulphidation procedure on the physico-chemical properties and catalytic activity (R. Prada Silvy et al.). Activation of unsupported and Al2O3 supported Co-Mo catalysts in thiophene hydrodesulphurization (T.I. Korányi, Z. Paál). X-ray photoelectron spectroscopy (XPS) studies of oxides and sulphides of molybdenum and Ni-Mo/Al2O3 hydrodesulphurization catalysts (A. Katrib et al.). Influence of nitrogen feed content on the performances of a zeolite hydrocracking catalyst (P. Dufresne et al.). Preparation, physico-chemical characterization and catalytic activity of iron based hydrotreating catalysts (S. Yunes et al.). The role of zeolites in hydrocracking studies using petroleum fraction and model compounds (S. Sivasankar et al.). Polynuclear aromatic formation in hydrocrackers and their impact on catalyst stability (N. Abdul Latif). Catalytic hydrodemetalation of heavy oils (A. Bridge). Mild hydrocracking: optimization of multiple catalyst systems for increased vacuum gas oil conversion (J. Gosselink et al.). Mild and conventional hydrocracking: process conditions, products and catalysts (P. Nat et al.). Upgrading vacuum gas oil by hydrocracking (J.W. Ward). Hydrocracking of athabasca bitumen using oil-soluble organometallic catalysts (H. Chen et al.). The relation between the quality of catalysts and feedstock in the hydrotreating process (P. Lulic et al.). Upgrading heavy ends into marketable distillates: new concepts and new catalyst for two key stages, HDM and HDN (H. Toulhoat, J. Plumail). Diesel hydrodesulphurization - a practical correlation for catalyst activity (D. Fisher et al.). A mathematical model for catalytic hydrogenation of aromatics in petroleum refining feedstocks (L.M. MagnaBosco). The development and use of rate equations in catalytic refinery processes (G. Marin, G. Froment). The influence of diffusional resistances on the optimal control of catalytic reactors experiencing catalyst deactivation (S. Einashaie et al.). Static and dynamic simulation of steam methane reformers (I. Alatiqi et al.). Implications of the phasing out of leaded gasoline on refining process R&D (H. Tayim). Regeneration behaviour of platinum group metals promoted cracking catalysts (P. Steingaszner et al.). Summaries - Panel Discussions. Industrial experience in catalytic processes - past experience, future outlook. Advances in catalysis for the year 2000. Author Index. 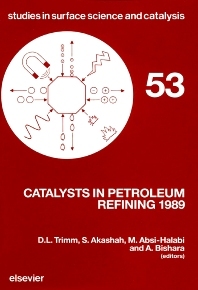 These proceedings reflect the important role of catalysis in petroleum refining and the effects of factors such as environmental legislation on the industry. They also show the emergence of significant scientific expertise in the Middle East - the cradle of the oil industry. Participants from all over the world took part in the meeting and the book contains a well-balanced selection of articles from both academia and industry. Current trends in the oil industry focused attention mainly on heavy end hydrotreating, but other processes also gained their share of attention. An invaluable feature of the meeting was the two panel discussions where participants took the opportunity to obtain advance on many real and immediate problems.